Question 492: Did Lady Fatemeh (peace be upon her) covering her face and hands? Please, explain in detail about Hijab of Sayeda Fatima (sa). Answer 492: Qena was prevalent among women by which some of them covered their face at the advent of Islam. According to some traditions narrated from our Infallibles (PBUTH), Lady Fatimah al-Zahra has used such coverage in front of non-Mahram. Qena means something by which women covers their face. Imam Baqir (AS) has said that Jaber bin Abdullah Ansari was with the Holy Prophet (PBUH). They went out of house in order to meet Fatimah al-Zahra (SA). “When we reached there, the Holy Prophet (PBUH) pushed the door and said: Assalamu Alaikum. Lady Fatimah (SA) replied: Wa Alaika assalaam ‘O the messenger of Allah (PBUH). The Prophet said: Could I come in? She (SA) replied: Yes, come in. The Prophet said: there is one person whom come along with me. Is he also allowed to come in? No, I don’t have a proper cover. Meaning that she didn’t have Qena on her face. It is said that during the Fadak event, when Fatimah (SA) wants to go out of house she always covered her face with Borgha’. When it is proved that Abu Bakr forcefully took Fadak and didn’t want to give it back to Lady Fatimah (SA), she covered her head with a veil and was going toward the Holy Prophet’s (PBUH) mosque. While she was among some religious women and her relatives, her clothes were long in a way that all of her body and feet were covered. She walked like the Holy Prophet (PBUH). When she reached the mosque, the people of Muhajir and Ansar created a place for her that men were unable to see her. It is understood from historical sources that women were observing hijab in the time of the Holy Prophet (s) (PHUTH), but not complete hijab because the Arab women would wear a scarf, but they would place the ends behind their head so that their earrings, neck and chest would show since their dresses were most often v-necked. They used to wear dresses with open collars leaving their necks and part of their chests visible. 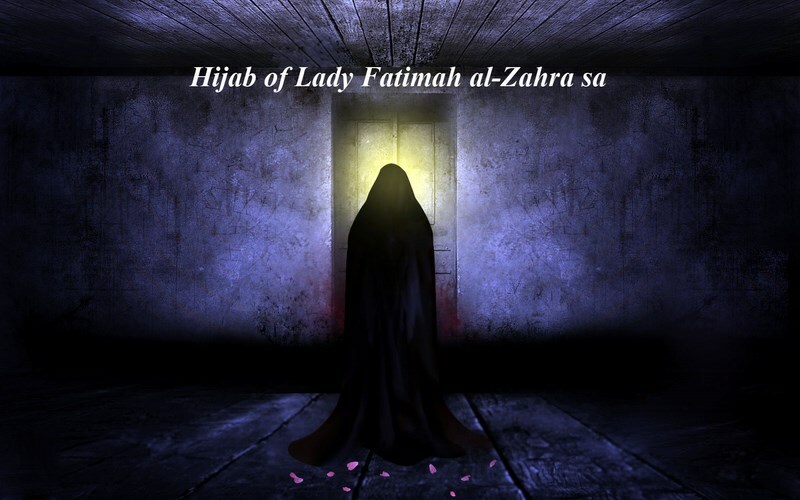 Lady Fatimah (SA) is the best example for all women from all around the world to follow her. She (SA) observed hijab completely, even when a blind man entered her house with the Holy Prophet (PBUH), she went out of the house in order that the man cannot even smell her. Also, she made a will to Imam Ali (AS) that when I die, shroud and bury me at night. O Ali, (AS) make a coffin for me that could hide my body. Lady Fatimah al-Zahra (SA) preferred to stay at home, however she went out (when necessary) while observing hijab completely in a way that nobody could see her as she was among some of her relatives and women of Muhajir and Ansar. Also, when she attend the mosque there was a place where she (SA) stood that nobody could see her.
 . Mojam al-Wasit, word of Qena.
 . Al-Kafi, Vol. 5, Pg. 528, al-Nikah Book.
 . Sheikh Sadouq, Elal al-Sharae’, Vol. 1, Pg. 163, Qom, Davari bookshop.
 . Sharh e ibn Abi al-Hadid, Vol. 16, Pg. 211 & 249; Ihtiyajat Tabarsi, Vol. 1, Pg. 131, Najaf publication.
 . Mutahhari, Murteza, Works Collections, vol.19, pg. 484 – 485.
 . Rawzatul Waedhing, Vol. 1, Pg. 151; Biharul Anwar, Vol. 43, Pg. 214.